I typically use http://testmy.net to test the performance of my cable modem link to the Internet. Since installing McAfee Internet Security Suite 9, I can no longer view results from this site. My suspicion is McAfee ISS. The site worked before the upgrade and I have had many other issues with ISS accessing other sites and blocking programs. I was driven to this exercise because I wanted to test Comcast's new "Speedboost" feature. Since I could no longer use testmy.net, I let my fingers do the Google to find a new site to test my connection. After browsing through a few sites, I stumbled on Speedtest.net. Maybe I am a sucker for a pretty UI, but this site is slick and easy to use. It displays your location, based on your IP address, along with test serers on a nice world map. The main window is Flash based. Just click on a server and the server will test your download and upload bandwidth automatically. Intermediate and final results are displayed in a speedometer like graph as well as numerically along with a one-way trip time, IP address, and server location. Previous test results are displayed in a table below the current results. Users can customize the units displayed in the table and it is probably stored in a cookie since they do not require any registration or knowledge of the user. Speedtest even creates a small graphic for display on your web site. 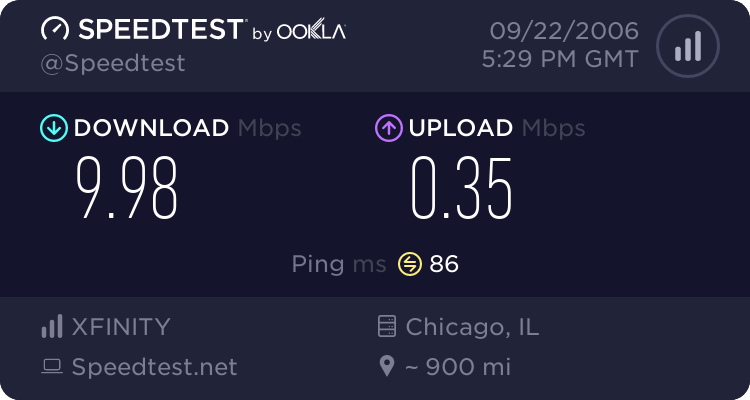 I was able to pull down 10 Mbit/s from their Chicago server a few minutes ago. If you want a slick, simple to use bandwidth tester, go to Speedtest. Speedboost works as witnessed by the results above. There are not many people using my CMTS node at the moment so I can hog up 4 Mbit/s more bandwidth than currently allotted. I just wish that my upload speed would occasionally go above 384 kbit/s so my VoIP service would work a bit better although QoS would really solve the problem.